Daniel Clement Dennett (born March 28, 1942 in Boston, Massachusetts) is a prominent American philosopher whose research centers on philosophy of mind, philosophy of science and philosophy of biology, particularly as those fields relate to evolutionary biology and cognitive science. He is currently the co-director of the Center for Cognitive Studies and the Austin B. Fletcher Professor of Philosophy at Tufts University. Dennett is also a noted atheist and advocate of the Brights movement. Dennett spent part of his childhood in Beirut, where, during World War II, his father was a covert counter-intelligence agent with the Office of Strategic Services posing as a cultural attaché to the American Embassy in Beirut. The young Dennett and family returned to Massachusetts in 1947 after his father died in an unexplained plane crash. His sister is the investigative journalist Charlotte Dennett. He attended Phillips Exeter Academy, and received his B.A. in philosophy from Harvard University in 1963, where he was a student of W.V. Quine. In 1965, he received his D.Phil. in philosophy from Christ Church, Oxford, where he studied under the ordinary language philosopher Gilbert Ryle. Dennett is currently (May 2007) the Austin B. Fletcher Professor of Philosophy, University Professor, and Co-Director of the Center for Cognitive Studies (with Ray Jackendoff) at Tufts University. Dennett describes himself as "an autodidact — or, more properly, the beneficiary of hundreds of hours of informal tutorials on all the fields that interest me, from some of the world's leading scientists." Dennett gave the John Locke lectures at the University of Oxford in 1983, the Gavin David Young Lectures at Adelaide, Australia, in 1985, and the Tanner Lecture at Michigan in 1986, among many others. In 2001 he was awarded the Jean Nicod Prize and gave the Jean Nicod Lectures in Paris. He has received two Guggenheim Fellowships, a Fulbright Fellowship, and a Fellowship at the Center for Advanced Studies in Behavioral Science. He was elected to the American Academy of Arts and Sciences in 1987. He was the co-founder (1985) and co-director of the Curricular Software Studio at Tufts University, and has helped to design museum exhibits on computers for the Smithsonian Institution, the Museum of Science in Boston, and the Computer Museum in Boston. He is a Humanist Laureate of the International Academy of Humanism and a Fellow of the Committee for Skeptical Inquiry. The American Humanist Association named him the 2004 Humanist of the Year. He is also an avid sailor. In October 2006, Dennett was hospitalized due to an aortic dissection. After a nine-hour surgery, he was given a new aorta. In an essay posted on the Edge website, Dennett gives his firsthand account of his health problems, his consequent feelings of gratitude towards the scientists and doctors whose hard work made his recovery possible, and his complete lack of a "deathbed conversion". He reportedly also, upon having been told by friends and relatives that they had prayed for him, asked them, "Did you also sacrifice a goat?" He lives with his wife in North Andover, Massachusetts, and has a daughter, a son, and two grandsons. In Consciousness Explained, Dennett's interest in the ability of evolution to explain some of the content-producing features of consciousness is already apparent, and this has since become an integral part of his program. He defends a theory known by some as Neural Darwinism. He also presents an argument against qualia; he argues that the concept is so confused that it cannot be put to any use or understood in any non-contradictory way, and therefore does not constitute a valid refutation of physicalism. 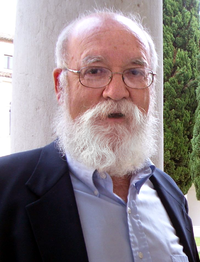 Much of Dennett's work in the 1990s has been concerned with fleshing out his previous ideas by addressing the same topics from an evolutionary standpoint, from what distinguishes human minds from animal minds (Kinds of Minds), to how free will is compatible with a naturalist view of the world (Freedom Evolves). In his 2006 book, Breaking the Spell, Dennett attempts to subject religious belief to the same treatment, explaining possible evolutionary reasons for the phenomenon of religious adherence. [Others] note that my 'avoidance of the standard philosophical terminology for discussing such matters' often creates problems for me; philosophers have a hard time figuring out what I am saying and what I am denying. My refusal to play ball with my colleagues is deliberate, of course, since I view the standard philosophical terminology as worse than useless — a major obstacle to progress since it consists of so many errors. Yet, in Consciousness Explained, he admits "I am a sort of 'teleofunctionalist', of course, perhaps the original teleofunctionalist'". He goes on to say, "I am ready to come out of the closet as some sort of verificationist". In Breaking the Spell he admits to being "a bright", and defends the term. Dennett sees evolution by natural selection as an algorithmic process (though he spells out that algorithms as simple as long division often incorporate a significant degree of randomness). This idea is in conflict with the evolutionary philosophy of paleontologist Stephen Jay Gould, who preferred to stress the "pluralism" of evolution (i.e. its dependence on many crucial factors, of which natural selection is only one). Dennett's theories have had a significant influence on the work of evolutionary psychologist Geoffrey Miller. He has also written about and advocated the notion of memetics as a philosophically useful tool. Breaking the Spell: Religion as a Natural Phenomenon (Penguin Group 2006) (ISBN 0-670-03472-X). Greek translation by Dimitris Xygalatas and Nikolas Roubekas: Απομυθοποίηση, Thessaloniki: Vanias 2007. ISBN 9789602881989. ^ Dennett, Daniel C. (2005-09-13) . "What I Want to Be When I Grow Up". in John Brockman. Curious Minds: How a Child Becomes a Scientist. New York: Vintage Books. ISBN 1-4000-7686-2. http://www.edge.org/books/curious_index.html. ^ Although Dennett has expressed criticism of human sociobiology, calling it a form of "greedy reductionism," he is generally sympathetic towards the explanations proposed by evolutionary psychology. Gould also is not one sided, and writes: "Sociobiologists have broadened their range of selective stories by invoking concepts of inclusive fitness and kin selection to solve (successfully I think) the vexatious problem of altruism—previously the greatest stumbling block to a Darwinian theory of social behavior. . . . Here sociobiology has had and will continue to have success. And here I wish it well. For it represents an extension of basic Darwinism to a realm where it should apply." Gould, 1980. "Sociobiology and the Theory of Natural Selection" In G. W. Barlow and J. Silverberg, eds., Sociobiology: Beyond Nature/Nurture? Boulder CO: Westview Press, pp. 257-269. This page was last modified on 1 April 2009, at 08:38.